I was recently given the opportunity to review a new unique barbecue sauce from Sharone Hakman, a competitor in season one of Fox's reality cooking show, MasterChef. "The most delicious BBQ sauce EVER made..."
Wow! That's quite an endorsement from an exceptional chef. Comments like that, and the following made me anxious to try it. "This burger is electric chair food, do you understand? If I was going to the electric chair I would want that burger." The first thing that struck me about this sauce is the packaging. It's bottled in a 12-ounce whiskey flask-style bottle with a distinctive modern flat black and orange label. Beyond looking sharp, it's fitting, given that the sauce is dubbed as masculine and refined, and it's made in small batches like fine whiskey. As always, I next turned my attention to the ingredient list. I was very pleased at what I saw, and what I didn't see. When I cracked the bottle open for a small sample the color and consistency make it very apparent that this sauce is special. It has a dark, deep, and rich mahogany color. The consistency is very thick, with plentiful flecks of onion and garlic running through it. I found that it smelled and tasted exactly how it's described in the PR release that came with the sauce, with the possible exception of the comparison to scotch. I've never thought of scotch as being sweet or tangy. Other than that, the description is spot-on. "... embodying the layers of sweet and tangy akin to a perfectly aged scotch. Punctuated by caramelized onions, a deep smack of bourbon and smoky roasted chilies ..."
For the true taste test I seasoned some thick pork chops that I brined and seasoned with some simple season salt and black pepper. I grilled the chops and applied a thick layer of the sauce just a minute or two before they came off of the grill. The flavor was bold and sophisticated with a great balance of sweet smokiness and a bourbon undertone that really works. The heat starts gently and builds to a nice intensity that is short of too much. This is not for those with tender palettes. The "masculine" description is apropos. Overall I was very pleased with this sauce. I'd call it a "boutique sauce". It isn't likely to be your go-to sauce for most applications, but it's a great choice for hearty cuts of meat where you want something truly special. The price reflects the fact that this is a small-batch sauce. A 12-ounce bottle will run you $8.00, plus $2.99 for shipping. It's available exclusively at the Hak's BBQ site. 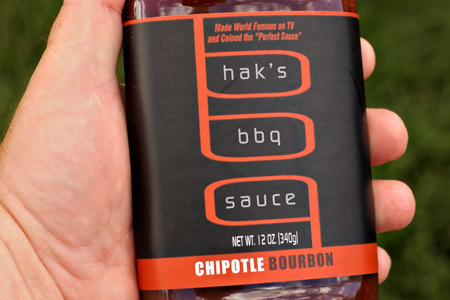 Hak's future plans include Thai Chile Tamarind and Habanero Pineapple releases later this year, and eventually a line of BBQ rubs and marinades. Obligatory Disclaimer: The sauce was provided to me free of charge for the purpose of this review. I was not compensated for the review, and I have no affiliation with Hak's BBQ. Thank you for sharing such a great review. We take a lot of pride in making our sauce and to read a post like yours keeps us striving for more. All the best ! I am buying some of this based on what I have heard from you, John. You won't be disappointed, Chris. It really is a, pardon the expression, special sauce. Let me know what you think. I'm glad you liked it, Rob. I'm surprised you like this - the sauce is full of bad ingredients, including an MSG alternative and LIQUID SMOKE! This is far from a real bbq sauce recipe - more like a lab experiment, and it tastes like it too. Anonymous (how predictable) - It's interesting that you know for a fact that the sauce contains "an MSG alternative" and "liquid smoke", given that they're not listed on the label. The sauce is very good, and I stand by my review. I love the flavor of this classy BBQ sauce! Deep, dark, elegant. This would make a great Father's Day gift for a very lucky griller! Brian - I agree completely. It's a great top-shelf masculine sauce.